Chief putter engineer @AustieOdyssey from @OdysseyGolf discusses the importance of putter MOI and the new EXO line. Are you obsessed with your golf gear? As a group, golfers are notorious for stressing over the most minute of golf club details. 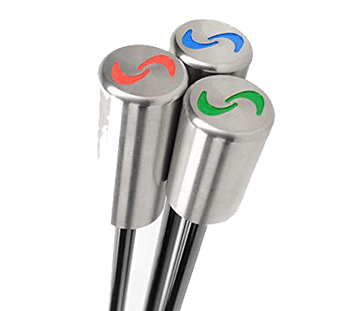 The game of golf is just so damn difficult that we feel the need to dial in our equipment with precision to a single gram, or single degree. The hope is that precisely fitted equipment provides the best opportunity for success. We know that little things can make a huge difference. The most obsessed among us dial-in lofts, lengths, lie angles, flexes, alignment schemes, grip textures, and even grip wrap additions down to the 1/16 of an inch. Thankfully, our play data supports our obsessiveness. Clubs that fit better result in better swings and better scores. That’s why getting fitted for clubs is a must. Most of us have been fit for our swinging clubs, but the poor putter has, more often than not, made the game bag because it looked nice, or inspired confidence. Times are changing, however, and golfers are starting to grasp the idea that choosing the right putter is about more than finding one that looks and feels good. Golfers are starting to realize that the putter that can inspire confidence for the long term is the one that has the correct length, toe hang, lie, and loft. Kudos to us for approaching putter selection with the same precision as driver and irons selection! Why Should Moi Care About MOI? If you are a French golfer, then you definitely should be concerned about how clubs will perform for moi, but that is not what we are diving into today. Instead, we will be looking at the MOI – short for Moment of Inertia. Many of us already insert MOI into the conversation when we talk about golf clubs since it’s a huge talking point and element of modern golf club design. If you put MOI into the search bar at the top of this page, you’ll find twenty-three pages of articles where MOI is mentioned. MOI discussions happen in the context of drivers, fairway metals, irons, and yes, even putters. The general idea is that, from an MOI perspective, bigger. Larger is often more forgiving. Just last year we showcased the mightily massive Evnroll ER9, with an MOI over 10,000 mark. 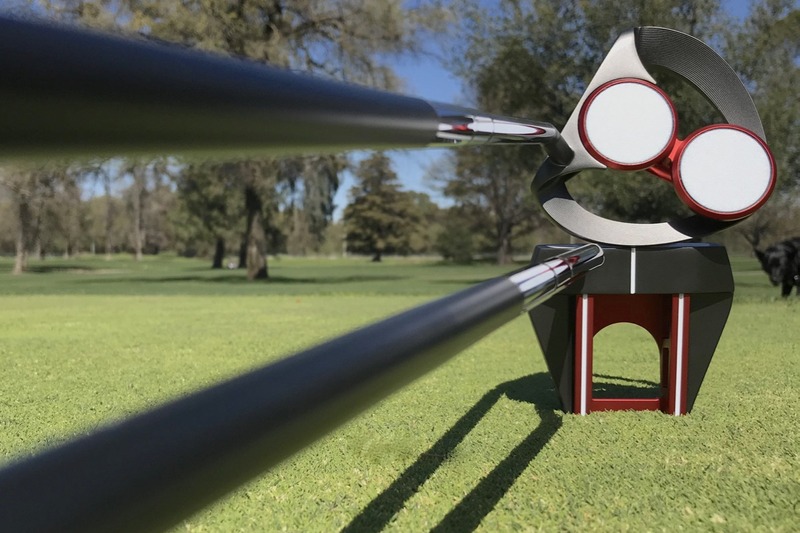 Scotty Cameron recently announced a new Phantom X line that features multi-material construction to boost MOI. If you head over to the Cure Putters website, you’ll see that they allow customization of weighting of the RX5 putter model to achieve MOI over 18,000. Does that MOI number mean that we should all be switching to the Cure RX5? What should we really be looking for when shopping putter MOI? This MOI question seems like one best left to the experts, which is fine, since I happened to meet with a few putter experts when I visited Odyssey headquarters back in December. While a good portion of the discussion that day revolved around the new Stroke Lab shaft, there were a couple of slides in their presentation about MOI that popped out as we were going through the new 2019 EXO models. To quickly review, the EXO line of putters, first launched in 2018, utilizes multi-material construction to boost the MOI values. You can find more details about the 2019 EXO line, and all of the other Odyssey offerings HERE. 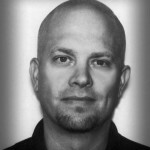 While previous Odyssey designs offered elevated MOI, EXO was the first to cast MOI as the main character of the story. 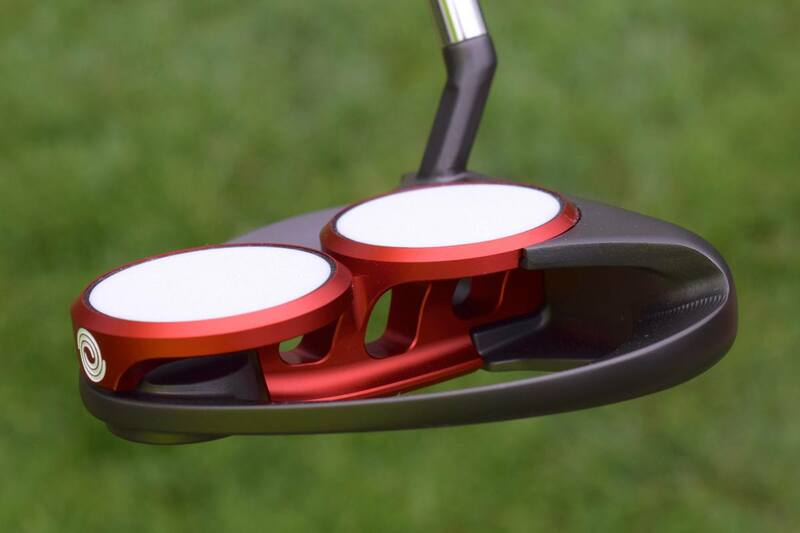 But again, what is MOI, and why should I care about it in my putter? 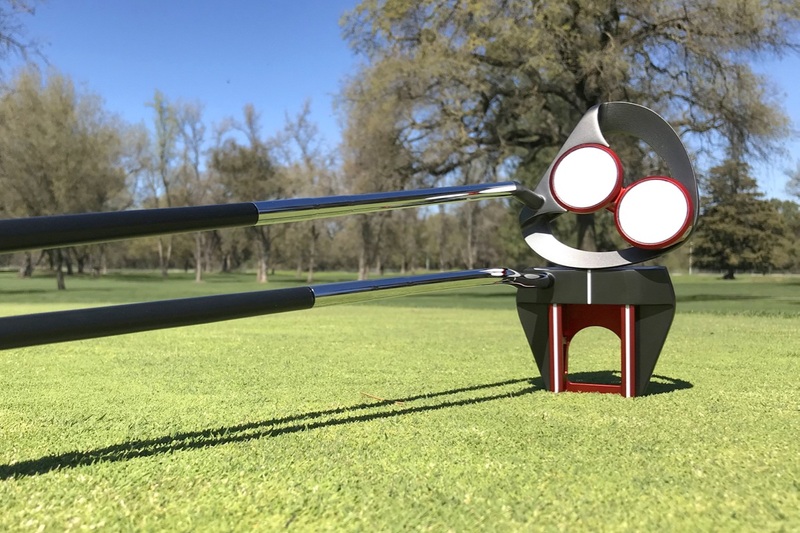 The 2019 Odyssey EXO putters will soon be in a shop near you (like at the end of the week), so it seems like a good time to address these and other questions with Odyssey’s Chief Putter Designer, Austie Rollinson. What follows are Austie’s responses to my questions about MOI, and its role in the new EXO designs. What is MOI, and how is it defined/measured? Moment of inertia, in the technical sense, is the rotational analog to mass. In Newton’s famous 2nd law of motion, F=ma, the “m” is the mass of a body and “F” is the amount of force needed to be applied to change its speed, “a” (acceleration). The higher the mass of a body, more force will need to be applied to change its speed the same amount. This describes linear motion of an object. In a collision, like a golf impact, we need to look at rotational motion. An off-center hit in a golf shot will produce a torque on the head. The torque will cause the head to rotate about an axis through the heads center of gravity. The farther away the impact is from the CG, the larger the torque will be. This torque will cause the head to rotate about the head’s CG at a speed proportional to the head’s moment of inertia (the rotational analog to mass). Thus, for a given torque (off-center strike) the large the head’s moment of inertia (MOI), the slower the head’s rotation rate. This will cause the head to rotate less during impact and the shot will be straighter. So, how do you measure a heads MOI? The important thing to know about MOI is that in the linear 2nd law the sum of all the mass elements, or total mass, is used in the formula. In rotational motion, you need to know the sum of all the mass elements as well as the distance those elements are from the rotational axis. The farter the mass elements are away from the axis, the higher the MOI of the body will be. That is why larger and hollow club heads have a higher MOI than smaller, more solid heads. Most 3D CAD programs can calculate the mass of an object, the center of gravity location, and the MOI of a model. The programmer just has to input the densities of the components and the software does the rest. If you just have a head in your hand, you can use an instrument designed to measure MOI and CG. This is handy to confirm that the in-hand prototypes match the mass properties you designed in CAD. Why does MOI matter in a putter? The same way that MOI helps in drivers and irons be more forgiving on off-center hits, putters benefit from this effect as well. The speeds of a putter are very different than those of drivers and irons. With drivers, you are swinging the head anywhere from 90mph to 120mph. On putters, you swing the head anywhere from just above 0 mph on tap-ins to about 8-9 mph on longer 25-35-foot putts. However, off-center hits even at these head speeds produce significant losses in ball speeds and change the side angle at which the ball leaves the putter face. No golfer is perfect in their impact locations. The more you can help to mitigate these losses the closer to the hole your ball will end up…helping reduce your number of putts. What will a golfer likely experience as he/she moves from a low MOI putter to a high MOI putter? The golfer will most likely see putts that stay on their intended line better as well as better distance control. 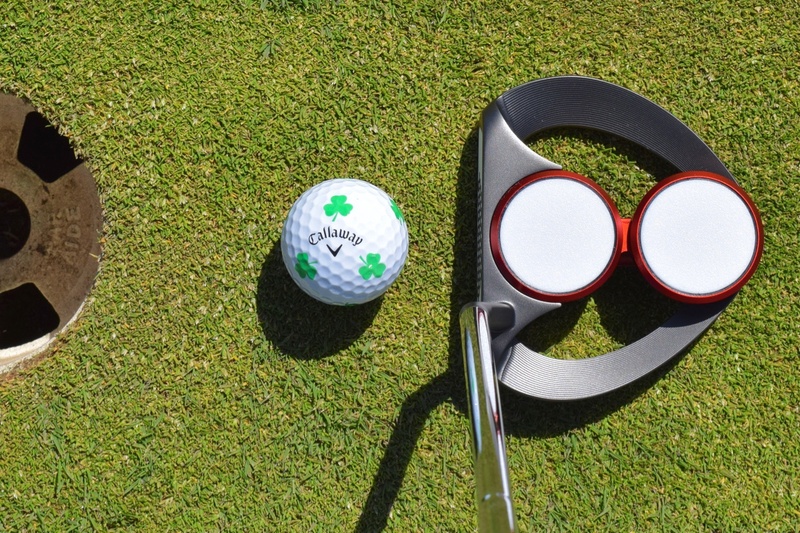 These all depend on the accuracy and consistency of how the golfer delivers the putter to the ball. Inconsistencies in head speed and face angle will cause inconsistencies in ball speed and direction that MOI will not fix. The MOI will help smooth out the inconstancies in impact location across the face. Are there any disadvantages to increasing MOI in a putter? More often than not the size of the head needs to get larger to make large gains in MOI. Also, designs also need to become more ring-like in appearance to really enhance the MOI while keeping the footprint of the putter small. The other disadvantage to chasing large MOI in a design can be that the CG of the putter gets deeper in the putter head. This can cause more movement in the face laterally for off-center hits. This creates larger side angle discrepancies even with large MOI values. In good designs, we look to optimize MOI while still working to keep the CG as shallow as possible in the design. 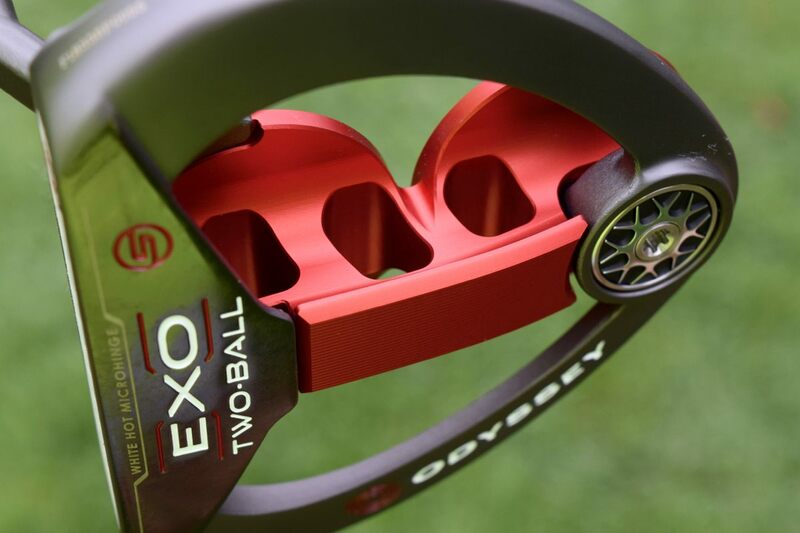 How does the Odyssey EXO line of putters achieve optimum MOI numbers? In the EXO line of putters, we utilize steel and aluminum to achieve designs with high MOI values yet small footprints. All of the EXO putters have an aluminum truss in the center of the putter to enable us to move mass to the perimeter of the putter in steel. For example, on the EXO SEVEN design the aluminum truss in just 8.8% of the total putter’s mass while the stainless accounts for 88% of the mass. This enables us to increase the MOI of the design 21% over the standard large #7 design. 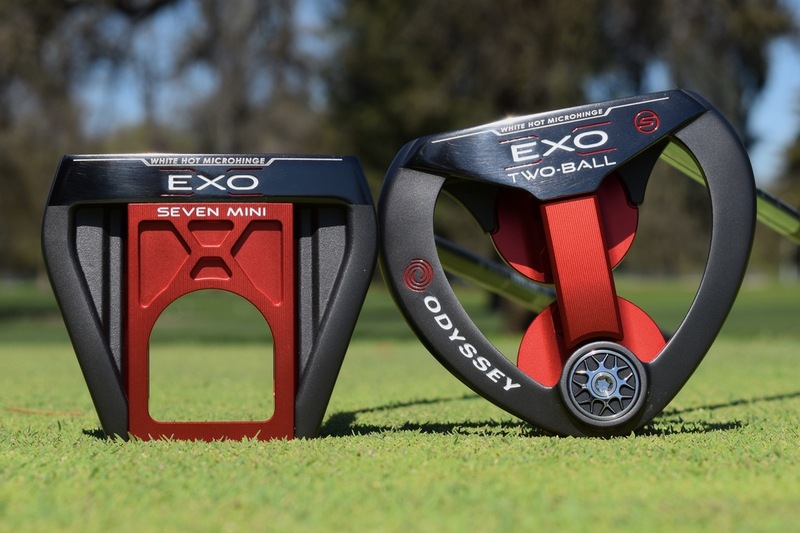 In the EXO SEVEN MINI, we were able to increase the MOI by 26% over the standard #7 design. Where in the shopping/fitting process does MOI enter into the discussion vs. looks, length, weight, lie, loft, and etc.? During the fitting process, you should access what your typical misses are. If you are constantly off-line and have poor distance control, you should definitely look at a high MOI putter. It is likely that your hit location is inconsistent. A high MOI will help to mitigate the energy loss and putter twist to make these misses more consistent. Also, if your line is off, it could be due to not being able to align the putter square to the target line consistently. 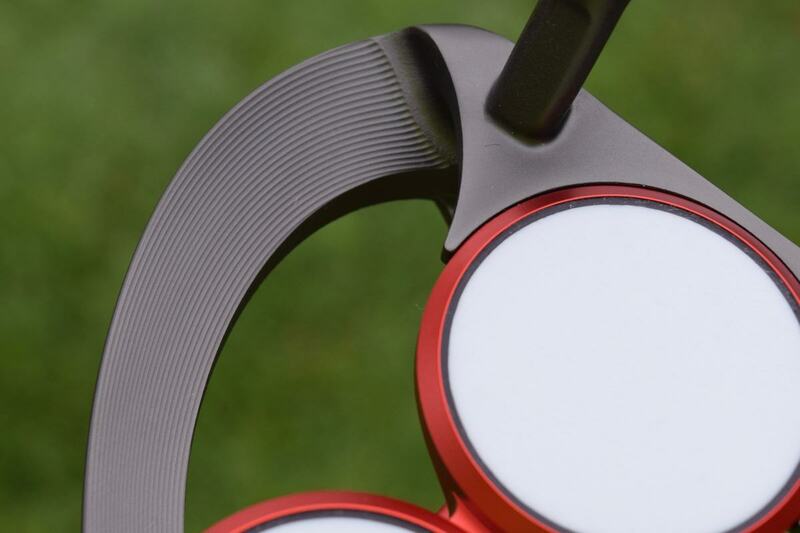 Most hit MOI putter designs have enhanced alignment features on the crowns to help with alignment. Does that clear up the MOI question for you? 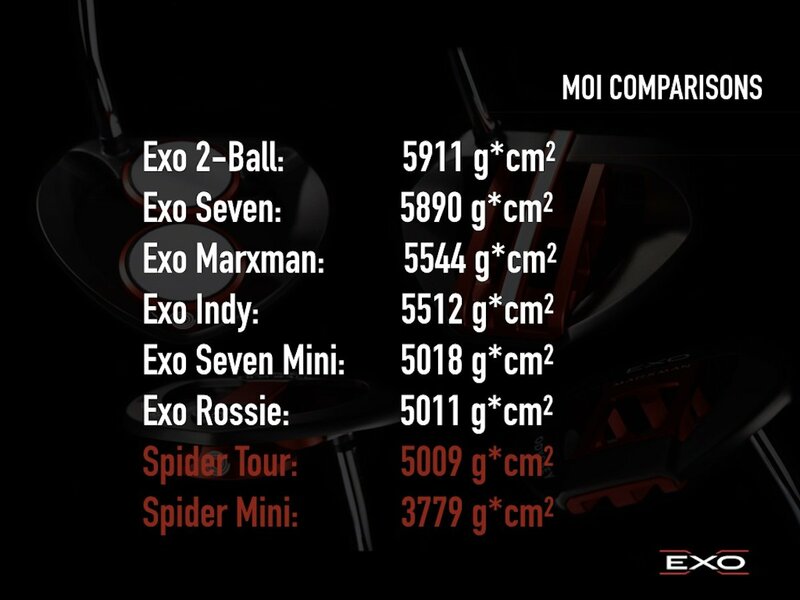 I think that one of the things about the EXO line that Austie forgot to mention is that they were able to boost the MOI values, and still make putters that are nice looking, traditional-ish shapes. Some of the other high MOI putters, like the Cure RX5 that I mentioned above, have higher MOI values, but it comes at the cost of traditional aesthetics. Most of us want to carry the putter that sinks more putts, but if I’m honest, I’m not going to carry a putter that I can’t stand to look at. I’m unwilling to purchase a putter where aesthetics have been completely sacrificed for MOI or any other characteristic. Those of you still bagging the Nike Sumo SQ 5900 driver won’t feel me on this, but I think that most golfers are of the same mind. That’s the beauty of the EXO line. If I am going to be spending hundreds of dollars on a putter, I want one that I can spend hours looking at, exploring the angles, and finding cool features like the milled lines in the perimeter ring. I’ll admit that my putter obsession is more severe than the norm, but you can’t help but appreciate the aesthetic detail that goes into these. The fact that there were designed from a performance-enhancing directive makes the visual success of the EXO line that much more significant. It could hang on the wall, but it’s meant to drop balls in cups. I’m sure that the putter MOI story is far from over, but that’s not true for your EXO wait. You should be able to find the new 2019 EXO models in a shop near you at the end of the week. Don’t forget that the new mallets will also come with the S-neck option, fitting those of you with more of an arcing stroke. Included as well will be the new Odyssey Stroke Lab shaft. I’m never going to say that a $349 putter falls into the cheap range, but there is definitely a bunch of value and technology coming at that price. So what are your thoughts on the EXO line, and putter MOI in general? Is there a particular EXO model that you are thinking of trying, or have you already pre-ordered one? Check them out online at the Odyssey site, or better yet, go test-roll one at a shop near you. Is there a critical MOI? You mention putters with MOIs of 10k and 18k. Is there really a big difference in the twist-dampening effect between those MOIs? At what MOI do you start seeing diminishing returns? Because putters are tempermental, I have 3 so they can be punished when they act up. The MOI varies but it doesn’t matter because none work well for long. Amazingly the one that I use the most and keep going back to is the one with the least MOI, a 40+ year old Bullseye. From my experience, maybe because of head size, high MOI putters give me more distance control problems. I think to some degree there’s always going to be a trade-off in feedback when it comes to high MOI and low MOI putters. Like bladed irons you can feel where you hit the face more accurately than you can with cavity-backs or super-game-improvement irons. So while high MOI putters can get you to the hole more often, they might not actually help improve your putter stroke. You can feel your Bullseye twist in your hands when you miss hit a putt and you can learn when you strike it out of the middle. Great Article! Are there ever scenarios where lower MOI benefits a player’s stroke? Many tour players are still playing blade style putters. Is this just because they are very consistent and prefer the look?